Yeehaw!!! I got the notice today, I (Floyd Reed) made tenure, effective July 1st!, with a promotion to Associate Professor, effective August 1st! (I guess for the month of July I will be a tenured Assistant Professor, which is a strange combination). Thanks to everyone out there that had a role in helping me get to this point! Also, thanks to the external reviewers of my tenure application---I do not know who most of you are by name so I cannot thank you personally but there is a chance you might read this. I can't say enough how much of a relief this is---I get to keep my job and continue my career. I am not being overly dramatic; a lot of people outside of academia don't realize that you get one shot at this and if you don't get tenure that's it, you're fired. I am also getting too old, career-wise, to be hired at an assistant professor level elsewhere and tenure-track jobs within a particular field are few and far between. I had my concerns about not getting tenure. There has been an ongoing university budget crisis with a hiring freeze. I have not been able to bring in a federal (NSF, NIH, NASA) grant here at UH, and this is not for a lack of trying. However, it is also widely recognized that the current funding situation in the US is abysmal. I did however get some in-state non-profit research funding which was a plus. I have also had difficulty bringing in graduate students. I think part of this is related to moving here from Germany and not having connections in Hawai'i and the US/Canada West/West Coast, where a lot of graduate students here are from. However, this is beginning to change as I make more connections here. I also had to serve as a witness in two internal investigations, which put me in very awkward positions as a non-tenured professor (I am not allowed to go into detail about who was involved or why and this statement does not imply any individuals in particular). On the positive side I have been successful in conducting and publishing research despite a general lack of funding (currently 31 total publications with 3,185 total citations, an H-index of 18, 2 patent applications, and an i-10 index of 21 since 2011 with 11 publications since August 2011 when I started here at UH). Some of my past publications in Science and Nature Genetics have literally become textbook examples of evolutionary genetics. I have also been teaching a wide range of classes at both the undergraduate and graduate level, one of which is a core class for biology majors and has large enrollment, and received positive teaching evaluations which was also a plus. Finally, I have been an invited speaker both nationally and internationally and attended invitation only workshops, which helps show that I am established within the field. It has been a long road and underscores that a career in research in academia is not for everyone. This August will have been 25 years since I first went to college (1991) and 20 years since I first started graduate school (1996). In the US 50% of graduate students do not make it through graduate school and 75% of Ph.D.'s do not get a tenure track position (although there are certainly non-tenure track careers for people with Ph.D. degrees). It is hard to find data on how many Assistant Professors make it to tenure, some estimates put it as high as 80%. While this is high the remaining 20% chance carries a lot of weight with it and can't be taken lightly. I do not mean to sound overly negative; I am extremely happy about receiving tenure. I just want the rest of the world to understand how serious this is and for people thinking about a career in academia to frankly understand (part of) what they are getting into. A job in academia has been compared to military deployment (without all of the associated military social welfare), you do not know where (geographically) you will end up, which is very different from most careers where you can control the region of the country (and the country) you will work in. Being a pre-tenure Assistant Professor is like having a 5 year long job interview where you will be asked all of the illegal questions (about your marriage status, children, religion, political views, ancestry, citizenship, age, etc.) by the people that control part of the hiring (tenure) process. At one point I was told by a chair of the department that my "problem" was that I had children and therefore was "not as committed to my work" as some other members of the department that did not have children. You have to chair committees that will put you directly into conflict with some of the faculty that will be voting on your tenure application (for example, as chair of the graduate admissions committee I had to explain to a professor in the department that the student they wanted to bring in for their lab was not admissible into the program, and stand by that despite requests for an exception) and occasionally you will be caught in catch-22 directives (e.g., this student cannot get class credit for the work in your lab and you can't have students working in your lab if they do not get class credit) where no matter what decision you make someone involved in the tenure decision making will be unhappy with you. On top of that, conducting research and publishing is one of, if not THE, most important parts of your job and a critical component of getting tenure. However, I (and I am not alone) am currently having to pay for this research out of pocket with my own personal money. Given the current funding climate you must be prepared for this. Also, contrary to the popular view, you will not be rich; professors do not get paid as much as the public thinks (the enormous salaries that appear in the newspapers are of university administrators), and you are only paid for nine months out of the year (and no it is not a vacation, you still have to work during those three summer months), and all those years of low pay as a graduate student and postdoc, with paying off college loans, and the difficulty of finding spousal employment while having to move every few years, needs to be factored in. 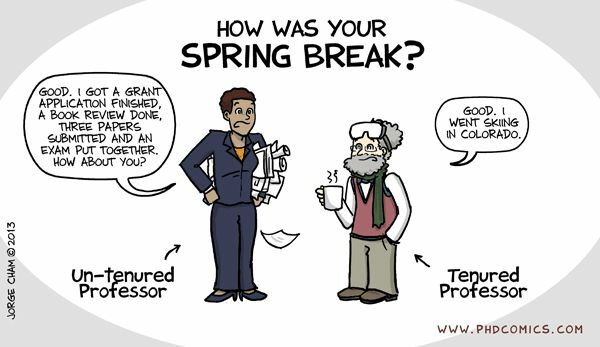 As you can see from why the tongue-in-cheek cartoons I have added to this post are funny, there is a disconnect between the popular public idea of tenure and the reality of tenure. A career in research in academia IS for people that are (either from wealthy families that support their education and career or) stubborn, tremendously self motivated, able to tolerate stress, and love critically thinking about and learning about the subject(s) within their field(s) that they are focused on. I think about genetic drift and selection when driving to the store to pick up groceries, most people do not do that. You also have to be dedicated to your work to such a degree that you will see projects through no matter what (e.g., when you end up getting scooped by another publication, the grant application is not funded, or reviewers reject your publication). And, you will spend a lot of time having to teach classes, reply to student's emails, do committee work, go to faculty meetings, and fill out endless red tape forms for the university bureaucracy. However, at the end of the day you have a job where to a large extent you are your own boss, make new discoveries, and you get paid to do (in part) what you are truly interested in, and you get to work closely and collaborate with people that are also afflicted with curiosity and excited about the world around them. While there is obviously room for improvement, for me the trade offs are worth it. This entry was posted in science career on June 4, 2016 by Floyd A. Reed.